The morning started out sunny and fine even though some of us were a little on the dusty side after last night, luckily I was ok, Dave didn't look to good. 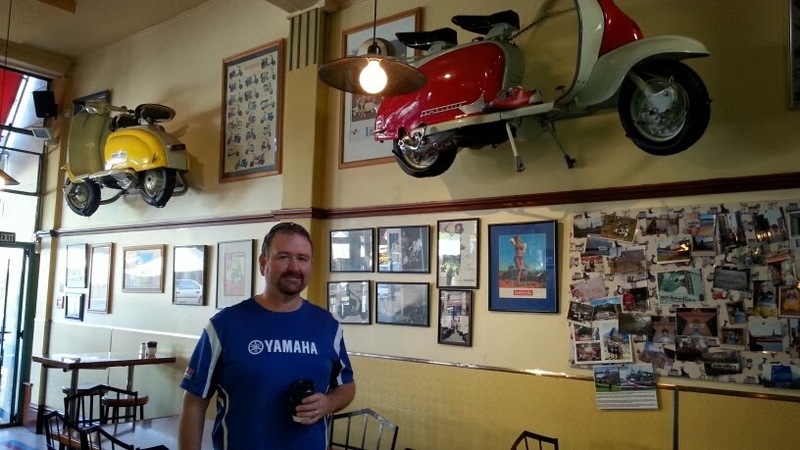 A quick breaky in Nelson at the Lambretta cafe and we headed on out towards Takaka Hill. I wasn't sure what to expect along here and if I thought yesterdays riding was a real treat then we hadn't seen anything yet. Takaka Hill was some of the most fantastic blacktop twisties you could find anywhere which wound its way from near sea level up to the peak of 791 metres(2595 Ft) and back down to the township of Takaka. I think Wayne put it best when at the lookout he said New Zealand must be the love child of Australia and Austria. The views along this road were magnificent. From the lookout you could see the road winding its way down through the lush forested hillside and down onto the valley floor and then out of sight. Beautiful. We made our way down into Takaka township which is just a small tourist village but very pretty. After a quick drink it was back on the bikes and it was so unfortunate that we had to ride back over the hill again to get back to Murchison. We put the cameras on the bikes halfway back up the hill and it was here that I captured the first camera of the trip biting the dust err tarmac. The centre stands came in for another hammering up and down Takaka Hill, ground clearance on these BMW's is a bit on the low side so I have to take it a bit easy. From here we fueled up again and headed out towards Murchison. The valley road along here until we got to Kohatu was a fantastic run of sweepers through the pine forested hills, pure riding delight. It was early afternoon and we stopped at this little cafe on the corner at Kohatu. Excellent coffee and caramel slice for a late lunch/early afternoon tea, it was to early for beers. It was along this section Geoff and Dave had swapped bikes. When Geoff pulled up he had a gopro in one hand with a mount missing some bits. He'd managed to catch Dave's gopro as it was falling off the handle bars. Nice one Roosty. There was rain coming over the tops of the mountains through here and I was certain we would need to stop and put on our rain gear but every time it looked like we were about to get wet the road suddenly turned away from the rain clouds and wound its way into the next valley over. The ride over Hope saddle was some excellent bit of road, with awesome views. Continuing on we made our way through Murchison and on into Upper Buller Gorge. I had driven Buller before but not ridden it, and was much more fun on the bike. The sections along the forest and river is fantastic riding and very scenic, it's more or less high speed sweepers all the way. We passed by the Swing bridge and jet boating, no time for that though. We then turned into Lower Buller Gorge which heads to Westport. There was a bit less traffic through here and the road was even better than Upper Buller. The sections along the river were magic. There was even the road going through this huge cutting out of the hillside with the road being single lane through. Lots of high speed sweepers with some slower corners thrown in with fantastic river views. It was spitting with rain in the last photo, so it was time to put the camera's away and enjoy the remainder of the road into Westport. We stayed at the Buller Bridge Motel here and the room was fantastic with comfy beds and no traffic noise outside with very friendly hosts. Another fantastic days riding even better than the day before, surely it can't get any better than this can it? Here's the best bits of lower Buller Gorge from the rock cutting. Day 2's thoughts on the bike. I've now mastered mounting the bloody thing. It's so tall I had difficulty getting on and off but now I just mount it like a horse by putting one foot on the left peg and step up and over onto the right peg. Sorted. Parking on angled surfaces is a bad thing as it's so top heavy and makes remounting near impossible and if the angle is too big the bike wants to topple over. I've started to have a hate/hate relationship with the massive screen on this bike. It's far to tall and if I ride along with the visor cracked the wind blast makes the visor vibrate and become noisy. It also makes lots of wind noise, if I move my head out to the left of the screen into the wind blast my helmet becomes almost dead quiet. I'd like to take a hacksaw to that screen. Enjoying the NZ report very much, tempting me to try get back there. Loving your thailand ride report and read you NZ several times. It's a fantastic place to ride isn't it. I do it again in a heartbeat. Sounds like another great day even with the flying GoPro incidences. Your issues with the tall BMW also sound like Brad with his Tiger 955. Get on it like a horse and also you really have to plan where you park because of the lean, etc. I wonder if that beast is as heavy as his too. Sometimes I thought the bike was going to fall over it was on that much of a lean, then I almost couldn't get back on. So after that I had to find flat spots to park. Gorgeous roads. Love the vids. That's what my dreams are made of. Glad that the camera spill didn't seem to lead to permanent damage. Your right we were living the dream. I loved the roads, as you well know as you got to ride the coromandel road on the 1050 triumph you lucky devil. Those cameras are pretty tough, as you will see in the days to come. He, he. So that's a little bit of one of my days' riding during the TT. As a mate of mine says "Buller Gorge rocks!" That TT2000 must be absolutely friggin insane. We only did 530 on the biggest day and was wondering where we would fit in another 470 to do the TT. Thats friggin nuts. Takaka was in perfect weather mate, it was one of the best roads ever. How many camera's got broken on the trip then? And I wondered about that screen, it is tall isn't it. I just put a screen on my bike but it's a lot shorter than that and a bit wider, still haven't had the chance to ride with it on yet so I'm hoping I dont find problems. The camera's came in for a bit of a hiding, there's more to come on that yet. I hated that screen, give me a hacksaw please. Steve, thoroughly enjoying this report and the very familiar sights you've captured. I had the same issues with mounting and dismounting the F800 - and I had the low seat option! A few times I was so concerned that it would topple over as I mounted I had Marty hold one handgrip as I climbed aboard. I had the same concerns as you, parking was an issue the whole trip. Especially on the side of the road when the camber dropped away. So hard to get on/off the thing. I did another 10 day squirt at xmas on the K1200, that was the first time though I had done Takaka hill....serious grin factor I know. Every time I ride through the Buller though it bloody rains. I still always enjoy it. You stopped at the same places as I did. This year rhough I went as far north as I could up to Karamea which is north of Westport and the beginning of the Heaphy track . That was an experience. We were lucky it started to spit at the end of Buller but I didn't even bother to put on the wets..Whats happened to you blog rogey, are you no longer updating? I can send you the permission slip if you'd like. Maybe you can get Jennie at a weak moment. Mate the roads there are fantastic and make our NSW roads look like goats tracks, and with scenery to die for. If you ever get the chance make sure you do it.